This site is intentionally simple, nothing flashy, with the emphasis on information, not looks. It is a record of my many attempts, failures, and successes at scratch-building model railway wagons and bashing other models into NZR shape, in the hope that I can share lessons learnt and generally promote and foster the building of NZR prototype rolling stock and locomotives. U-2 bogie flat wagon from a Frateschi flat car "kit"
Last updated : 10th May 2017 - J wagon and S wagon - BOTH FINISHED! Last updated : 7th May 2017 - H wagon - FINISHED! Triang track and rolling stock, with scratch-built station, platform, and signal box. OO on the lawn in 1968. This was followed by many many years of building and bashing model aircraft kitsets. Then I returned to model railways with a hankering to do NZR, and as we all seem to do, set in the years of one's growing up. For me it's the 1960's, but then was put off by the cost of readily available kitsets and in some cases (no offense intended to anyone!) not that fussed by what I saw considering the cost. So what to do? A few years ago I remember seeing the Frateshci NZR look-alikes at reasonable prices. 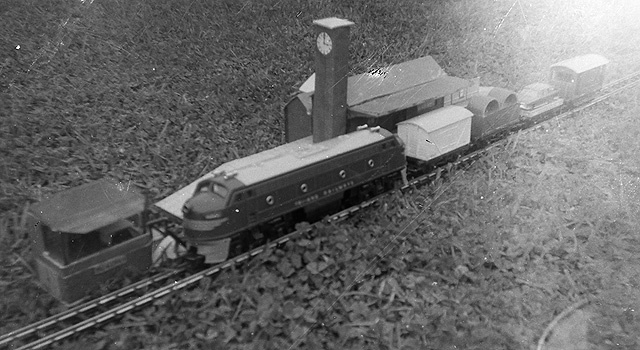 Their locos turned out to be more OO scale (slightly larger) than HO, and the "Da" a reasonable model of the NZR prototype. The "Dx" is reasonable too except for the too-large schnoz, but the "DC" looks more like a way-too-short DF. All look kit-bash-able though, and bodies are available separately - and relatively cheap too. Maybe they're not the best mechs but they do run very nicely indeed. So the purchase of one Frateschi "Da" in classic red is what kicked me off into doing NZR in OO (4mm to the foot) scale. So far all I've done to the Da is fit the not-so-good, supplied handrails, and swapped the couplers to body-mounted Kadees for test running rolling stock and to see how the general NZR "look" was progressing. One day I'll attack it with some weathering, and a few details e.g. proper (black for my era) wire handrails and a better looking, more complete headstock with separated paraphanalia and colour (plain for my era). And fix the "receeded hairline" white roof too - that should be light grey. And the body is in not quite the right proportions - a bit of research required. From studying photos the hood ends are the earlier style Phase I (note the headlight mountings) while the bogies are later so maybe that gets addressed too - don't know yet. Is that counting rivets? What to do about rolling stock then? I do want to capture the proper look of NZR, not just tart up American or British models. The Frateschi locos' intended matching NZR look-alike bogie rolling stock just didn't do it for me either. For a start NZR rolling stock is quite low-slung compared to other countries. British and American models look like they're on high horses in comparison. Plus I want four-wheelers too. The only thing left to do was build my own. Sticking to OO scale, I wanted to keep things simple and relatively easy, so am staying with the HO 16.5mm track gauge so there's no mucking about with sourcing narrower (14mm to be totally accurate in this scale) track and mechs and wheels. Hey 16.5mm scales out as 4ft 1.5ins. so not too wide. It's not like it's really 4ft 8.5ins as it is in HO scale ! HO gauge track and points are readily available and mostly cheap. And I like the compromise between amount of detail you can do in OO scale, and layout size. Speaking of scale. . .
OO scale, at 4mm to the foot and used mainly by British modellers, sits nicely in between American and European HO scale at 3.5mm to the foot, and American S scale at 4.76mm to the foot. In old-school fractions, OO scale is 1/76th, HO is 1/87th and S scale 1/64th. Many NZR modellers use the larger S scale, so they can use standard HO track that is correct for their narrower 3ft 6 inch gauge. The OO scale British modellers generally use HO track, which is too narrow for them by about the same amount it is too wide for NZR in that scale! 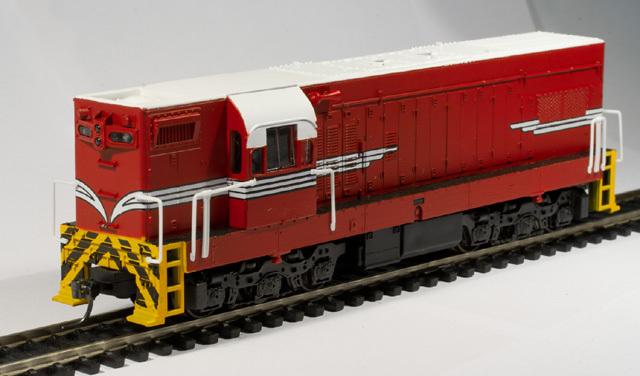 So for those who are happy with their look-alike Frateschi diesel locos in various NZR colours, running around on HO gauge track, you can make them even more convincing by having them haul your own scratch-built, genuine-outline, NZR rolling stock. At first it sounds daunting, but we're not entering finescale modelling competitions here! We want models to be relatively easy and cheap to produce, to very well capture the NZR look, and to be robust enough to take the knocks of running on a layout. Most of you may find it easier than you first thought. Especially with the availability of plastic sheet and ready-cut plastic and brass strips of all shapes and sizes, and specialist detail parts. And for that little extra help, laser cutting and rapid prototyping / 3D-printing are becoming more and more availabe to everyday peoples at reasonable costs. Just look at what the NZ120 folks are up to! If you've never done it before, pick an easy subject first. For example, I chose the La class steel open wagon. Two ends, two sides, and a bottom - a box with no lid and a bit of detailing. What would you choose if you were modelling a more modern era? Using the "Ozzie" chassis building method, you could easily and cheaply build bazillions of those container flats. It's all easier than you think! Give it a go!